I really liked that the money from this event is going directly to help four individuals (one couple and two sisters) who are still in Turkey, where they are not allowed to work. I got early bird tickets for $40 each (regular $50). The Grand Hall on the second floor. Cripes, UBC has changed since Wicca used to go there! The Nest is a beautiful building, with many spaces to hang out and study. Some of the many items up for auction. A gentleman from Tayybeh putting the finishing touches on the hummus. Everything was vegetarian or vegan except for the Kibbeh (meatballs). The schedule with dinner, a performance, and a few speakers. Mutabbal, eggplant spread with yogurt, tahini, garlic, and olive oil. Fattoush (salad) with lettuce, tomatoes, cucumbers, peppers, sumac, lemon, and olive oil. There were also crispy fried pita croutons sprinkled on top later. Kibbeh, meatballs with fine ground lean beef, rice, and spices. Yalanji, vine leaves stuffed with rice, herbs, and spices. 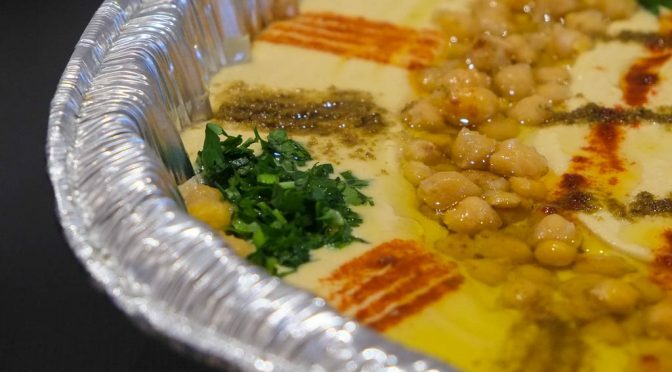 Fattet Hummus, layers of pita bread and hummus. Could be described as a kind of bread pudding. Baklava, phyllo pastry with chopped nuts and honey. A rep from AMS Refugee Relief MCing the event. Performance by Ahmad Khaldieh. That guitar he’s playing is an oud. Friendly gentleman from Tayybeh serving up the mutabbal (eggplant spread). Wicca’s plate. Even though it was mostly vegetarian, we got pretty full and satisfied. The fattet hummus (with crunchy pita bread pieces) was flavourful and lemony — our favourite dish of the night. The yalanji (grape leaves) and kibbeh (ground beef). Cross-section of the yalanji. Honestly I found it a bit gummy, but it was good to try. Mild spicing. Kibbeh with ground beef and rice. Not bad. A short video about the four Syrians we were helping bring to Canada. Mustafa (on the right) was a Biochemistry grad! But it’s a common theme among all of these refugees that war has disrupted and uprooted their lives. Kuol Deng Biong from Sudan, who is now studying political science and international relations, to understand how war starts and how to put an end to it. Zdravko Cimbaljevic from Montenegro. Now an LGBTQI activist. Anas Alsaid, a Syrian refugee. Anas gave a heart-wrenching presentation about a Syrian girl named Rayan, whose life was cut short at only three years old. Some stats and a few of the many ways a person can help out. Final performance of the night, a couple spoken word pieces by Marya Atassi. Forceful, depressing (her words), and necessary.